POLICE are investigating an armed robbery and assault in a stairwell in the Fountainbridge area. 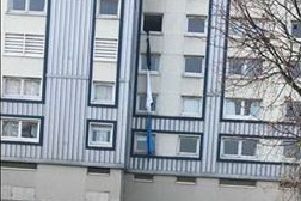 A man, described as being in his late teens, was attacked in the entrance to a block of flats near the junction with Gilmore Park at about 5.25am on Sunday. He had been walking along Fountainbridge heading towards Fountain Park when he became aware of two men following him closely from behind. They then grabbed him before pulling out knives. The men walked him to a nearby common stair entrance and once inside, one of the attackers stole a sum of money and his mobile phone before both left on foot. Detective Sergeant Robbie Wallace said: “The victim sustained no serious injuries, however this incident left him badly shaken. He said officers believe both men might have been loitering near a Scotmid shop on Lothian Road shortly before the attack and appealed for anyone who remembers seeing them to get in touch. They are described as white, aged between 20 and 40, about 5ft 10ins, with local accents. One man had a skinny build and was wearing a dark jacket with the hood up which had a badge or crest on the left breast pocket while the other had a dark beard and was wearing a dark jacket with the hood up and black woolly gloves.